The last day was easy flying. I think we all slept well, but I don’t know because I stumbled into dreamland, tripped over something, and came to eight hours later. The breakfast at the hotel was not horrific and we headed to the airport. I really like Cutter in Albuquerque. It’s not the fanciest or most modern FBO we have been to, but the people are really good at their jobs and they don’t treat the little planes as second class citizens. We were tied down around the corner from the main ramp, fully fueled, and the tie down job was really secure. That’s important when you are in for a night of fast moving storms. The sky was still quite angry, but it wasn’t actually raining. We loaded the plane up, taxied over to the edge of the ramp and called for our clearance out of ABQ heading west. We launched and flew a little north before turning southwest. Dexter wanted to stop in Phoenix again (where he and I spent the night the spring before), and that worked fine for a fuel stop. The terrain was quite high around Albuquerque (mountains ranging from six thousand to eight thousand feet high). The freezing level, even though it was August, was around ten thousand feet. And ahead of us there was a set of nine thousand foot peaks. The ceiling of the overcast clouds seemed to get lower as we approached the Cibola National Forest, and I finally had to call ATC and ask for an instrument clearance to Phoenix. As we climbed into the clouds I kept a careful eye on our outside air temperature and the leading edge of the wing. I turned on the pitot heat, which would keep ice forming on the probe which tells us how fast the airplane is sliding through the air. As we rode the victor airways through the mountains I would occasionally ask ATC if we could descend out of the clouds. The controller was polite, but explained that we were as low as he was allowed to let us be. There was no way to climb above the clouds, since these were the remains of the thunderstorms from the day before and they reached up to twenty thousand feet. Finally, we were allowed lower a little bit after the Arizona border. We flew over Show Low, an airport in the foothills for a town named after the turn of a card, and then we were on the other side and dropping quickly for Phoenix. We were not in our reserve fuel as we entered the pattern at Deer Valley, but we were certainly close enough that I didn’t like having to go around due to the tower controller’s poor spacing of the incoming planes. The FBO loaned us a car for lunch and we found PF Changs. An excellent meal in powerful air conditioning and we headed back to the plane. Nell said I looked a little wiped out, which was probably the hard flight the night before and the time in the clouds over the mountains, so I napped for twenty-five minutes in the sleep room at the FBO. The boys played on a computer in the crew room and Nell worked on her laptop. We loaded up in ninety-five degree heat to roll down a very long runway and a takeoff to the west. On climb out we saw another plane climbing with us for longer than I can ever remember a plane pacing us. The controller was talking to them, and the instructor (it was a student pilot) had us in sight. So I wasn’t worried, but it was still a strange feeling to be dogged by another plane. They eventually turned south. It was hot until we got above eight thousand feet. We had the windows filled with sunscreens. I really love that last leg home. We sailed over Interstate Ten, our wing gobbling up even the most ferocious desert speedsters. We saw desert communities like Blythe slide by beneath us, mysterious in their isolation and purpose. We turned north and could see the lens of shiny remains that is the Salton Sea, a sprawled monument to man’s hubris and ignorance of the power of nature. Palm Springs huddled in the shadow of it’s mountains. Sinatra used to lounge at a pool down there somewhere, looking up at this same sky. We are a white dot pulled across the smear of high cirrus. As high as we were, the two peaks on either side of the Banning Pass are higher. My friend TW says, “That pass is littered with the shiny remains of people that tried to get through in too much wind.” So I always pay close attention. His plane was once slammed suddenly into an eighty degree right bank (so he looked out the side, down the wing to the ground). No warning. So while I enjoyed the view I kept my hand on the control stick, and I watched the wind speed indicator. I asked the controller “how the ride has been for the little guys.” All reports were smooth so far. 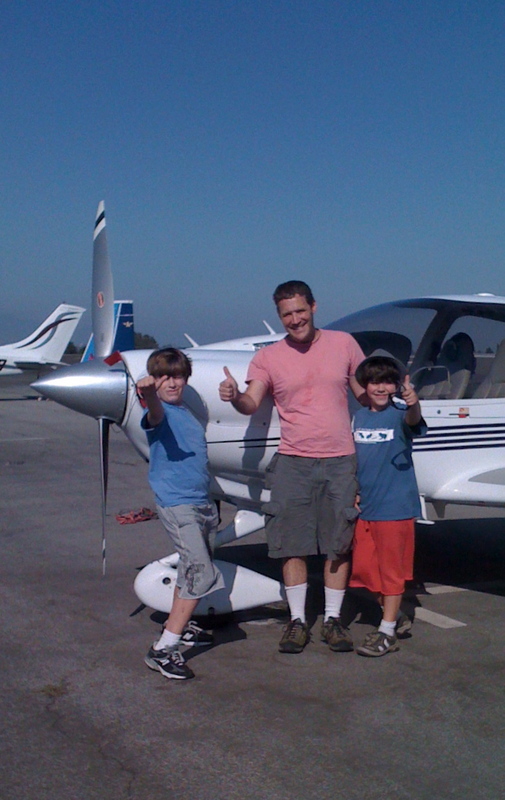 As we drew abeam Big Bear Lake I dialed in a descent for Santa Monica. We picked up speed and started to lose altitude. I warned the boys we were landing soon, so they started packing up their courier bags for the last time. SoCal Approach passed us off to Santa Monica Tower as we eased over Beverly Hills at a couple thousand feet. It was great to hear a familiar voice over the radio. We were cleared for a straight in approach to two-one and cleared to land. Our wheels dragged onto the grooved concrete of the five thousand foot long runway of N971RD’s home base. It was a long taxi back to our tie-down, since I landed long and didn’t brake hard, but I enjoyed looking at the FBOs, hangars and usual characters of our field. When I shut down Nell hopped out and moved the car out of our spot and the boys helped me push the plane back in.